Goals from Andriy Shevchenko and Frank Lampard helped Chelsea see off a hard-working Sunderland. 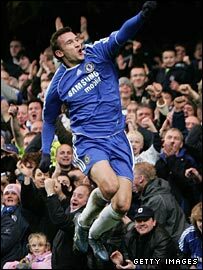 The unmarked Shevchenko stretched to head home Salomon Kalou's cross from close in for Chelsea's first. The Black Cats worked tirelessly to keep Chelsea at bay in the second half but failed to trouble Carlo Cudicini. Lampard made the game safe from the spot after Danny Higginbotham had tugged Alex's shirt, before Liam Miller saw red for a push on Claudio Pizarro. Chelsea will be steeling themselves for a spate of bruising encounters over Christmas and this flattening of one of the Premier League's featherweights moved them closer to pacesetters Arsenal and Manchester United. But the Blues will go through a key part of the season without their talismanic striker Didier Drogba, who underwent a knee operation earlier on Saturday. The Ivory Coast forward boasts more goals this season than Saturday's front two Kalou and Shevchenko put together. But the former came close to adding to his three league goals when he deflected Joe Cole's corner onto the bar after five minutes. And just 15 minutes later, the Ivorian picked out his unmarked strike partner Shevchenko who dived to head home from five yards. The hosts deserved more from a first half that they completely dominated. Black Cats boss Roy Keane indicated before the game that he was willing to "park the bus" in front of his side's goal and Kenwyne Jones was isolated up front, feeding on scraps and mistakes. Cudicini's only test of the first half was to gather Jones' bobbling low drive, while Darren Ward, again keeping Craig Gordon out of the side, was regularly peppered with crosses and half chances. As the rain lashed down in the second half, Chelsea poured forward, swamping the visitors' defence and breaking up sporadic counter-attacks. Sunderland worked hard to limit the home side's clear-cut chances, with Paul McShane and Higginbotham tirelessly chasing down runs and blocking shots. And as their confidence grew, Jones became more involved and he glanced a header wide from a tight angle. Halford had a long range effort comfortably saved by Cudicini and substitute Daryl Murphy flashed an effort wide from 25 yards. But when Higginbotham pulled Alex's shirt inside the box, Lampard drilled home the penalty to put Chelsea out of sight. Miller's late dismissal for pushing Pizarro just yards from the referee completed Keane's miserable afternoon. "We dominated the match but we could not kill the game off as early as we would have liked. "It was not easy to play against Sunderland because they defended cleverly with a lot of men. "It was a very mature performance because we looked for opportunities to find the second goal which we got in the second half with a penalty." "We weren't too bad and we did some good things but the sore point is the two goals we gave away. "It was fairly poor defending for the first as we didn't stop the cross coming in and a striker like Andriy Shevchenko won't miss from there. "When it's 1-0 you're in with a chance but the second goal killed the game." Chelsea: Cudicini, Belletti, Alex, Terry, Ashley Cole, Wright-Phillips, Obi, Lampard, Joe Cole (Sidwell 85), Kalou (Pizarro 66), Shevchenko. Subs Not Used: Hilario, Bridge, Ben-Haim. Goals: Shevchenko 23, Lampard 75 pen. Sunderland: Ward, Halford, McShane, Higginbotham, Collins, Miller, Leadbitter (Stokes 70), Etuhu, Whitehead, Wallace, Jones (Murphy 67). Subs Not Used: Gordon, Yorke, Cole.